Homeopathic remedy to relieve urinary urgency, frequent and painful urination. Painful urination? Pascosabal® can help! 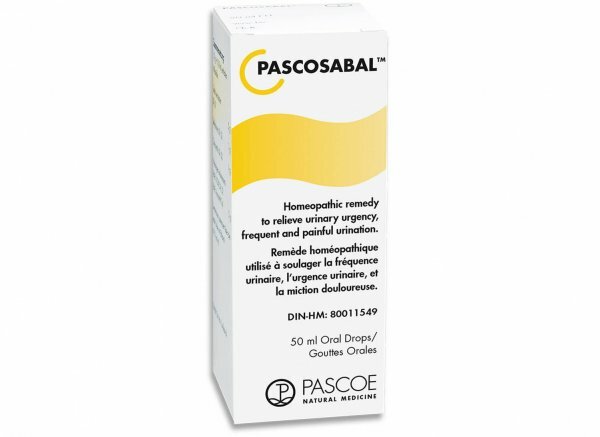 Pascosabal® is a homeopathic remedy to relieve painful, frequent urination. Pascosabal helps reduce inflammation in the urinary tract, ultimately easing the pain or discomfort associated with dysuria, and reducing the sudden urgency and frequency of urination. Pascobal’s antispasmodic effect helps curb the frequency of urination as well. Dysuria is the term used to identify pain or discomfort when urinating. Although dysuria is more common in women, both men and women of any age can experience it. The pain or discomfort felt has often been described as a mild to moderate burning sensation. However, for some, the pain can be quite severe. In most cases, symptoms usually dissipate after treatment is administered. Dysuria is most often caused by some sort of infection like a UTI, bladder infection or an STD, but it can also be caused by certain medications, chemotherapy drugs or even diet. Conventional treatment depends on the root cause, but may include antibiotics, painkillers or anti-fungal medications. The underlying infection causing the dysuria must be diagnosed and properly treated, as serious complications can occur without treatment. If dysuria is caused by an STD, all sexual partners need to be treated for the infection to prevent recurrence. The combination of active ingredients of the 4 plant components in Pascosabal, serenoa repens, hydrangea arborescens, atropa belladonna, and citrullus colocynthis have an anti-inflammatory and antispasmodic effect. Pascosabal is formulated to reduce the frequency of urination, as well as to ease the pain and discomfort associated with dysuria and other urological conditions. Due to various causes of dysuria and other urological conditions, it is best to see a doctor and be diagnosed so you may be properly treated. Diagnosing dysuria requires a physical examination, which for women, may include a pelvic examination. A blood test and a urine test will likely be ordered to determine the cause. There are many simple, natural things you can do to help ease the symptoms of dysuria. You can also incorporate these things into your lifestyle for prevention. (Chronic) 10-20 drops 1-3 times daily. In the absence of adequate experiential documentation, PASCOSABAL™ should not be used during pregnancy and breastfeeding except on the advice of a healthcare practitioner. Do not use in children under 12 years of age before consulting a health care practitioner. Consult with a health care practitioner if there is blood in the urine, fever or complaints that persist over 5 days. Antacid containing alkaline salts. Helps in the development and maintenance of bones.